I am hoping that beginning with excerpts will not seem too indulgent; I have certainly been put off by authors who quote themselves. Each of the three texts I will be revisiting here had specific purposes in relation to art history, theory, and criticism, and it matters that the general idea of "writing with images" began in such contexts. Still, if you would like to begin with the thing itself, stripped of the problems that generated it, please go straight to chapter 4. Each of these three excerpts concerns a gap between established forms of writing on art and what could, in different ways, be called interesting writing. The first gap is between writing and art history. The second is the smaller, but just as treacherous gap between interesting writing and visual studies; and the third is about the positive gulf between writing and art theory, aesthetics, and philosophy. 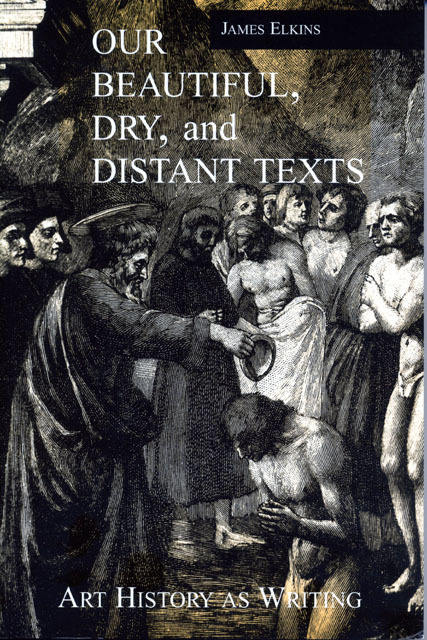 The seed of this project, and my first try at articulating a space between art history and interesting writing, was in the opening and closing pages from the book Our Beautiful, Dry, and Distant Texts: On Art History as Writing (1997, reprinted 2000). That was, or is, a long and oddly assembled inquiry into art historical writing. That book's introduction sets up the complaint. Then I reproduce the book's final page in its entirety. The book you’re holding is a strange introduction to art history. Strange because it fails to round up the usual suspects like social art history, psychoanalysis, feminism, deconstruction, or postcolonial theory. Strange, too, because it omits some of the leading work in the discipline. It may need more of an introduction than I first gave it, so I am adding a few words here of encouragement and apology. The three basic arguments of the book can be put succinctly. First, I am dissatisfied with the usual way of learning the discipline, in which students study parts of some theory (say Lacanian psychoanalysis) whenever it seems helpful for interpreting the art that interests them. That practice leads to monographs that read like tours of different theories: a little linguistics from Jakobsen, then some semiotics from Saussure or Barthes, an anthropological account of liminality or hybridity, and perhaps some reference to performative speech acts. This is exaggerating a little, but not much: it has become normal in art history to move from one interpretive model to another. Various names of drift in and out of the writing: Benjamin, Warburg, Riegl, Badiou, Foucault, Rancière, Deleuze. In a sense, that state of affairs is unobjectionable—after all, it serves the practical goal of finding the best words to describe the art. Behind this successful practice is a simple assumption, which I think should be deeply troubling: that it is possible to tell which theories are appropriate, and to know how and when they should be applied. I doubt that the motives or methods of interpretation are as well controlled as is often thought. That is the reason I avoid expositing individual theories in this book. The idea is to stop applying theories, or even studying them, and look at the whole discipline more abstractly. I want to ask: What tells me that I have found an optimal way to interpret a work? Do I know why I am attracted to this theory, or that one? It strikes me art historians are confident about these questions, and one purpose of this book is to reflect on that confidence until it disappears. The second theme enlarges the first: I want to argue that much of art history (and not just the manipulation of theories) is not entirely conscious. Most of this book is a meditation on the ways art historians meander among the works, only half in control of the discipline that leads them. Thinking about art and history is like daydreaming: we drift in and out of awareness of what we’re doing. Sometimes it may be clear what impels me to write a certain passage: other days, I have very little idea why a certain theory rings true, or a certain phrase sounds right. This book is a compendium of reasons why art historians are not in full control, and in that respect it runs strongly against the grain of contemporary theorizing, which remains rational and confident in the face of any number of post-structuralist accounts of the breakdown of intentionality and perfect rationality. Some readers of the first printing of this book thought it was unnecessarily pessimistic and anti-logical. For me, those aren’t bad things: I am half asleep when I look at art, and when I try to write about history. That’s the maziness of it, the lovely hopelessness of ever understanding my reactions to art outside of art history. The third and last theme is the most important, and it is the reason I am happy to see this book reprinted, even with all its unresolved conundra and odd backwaters. In the end, art history is a kind of writing. It has its blindnesses and its moments of control just like any other writing, and it expresses the lives and the thoughts of its writers just as much as any fiction. Normally art historians don’t think about the writing as writing, because it seems more important to convey the facts of the past that are being recovered and displayed for the present. Yet there is no way around it: what we write, as art historians—as academics of any sort—expresses who we are. By not thinking too much about the expressive dimension of our writing, we end up writing poorly. From a writer’s point of view, the writing in a typical art history journal might seem beautiful, but it probably also sounds dry and emotionally distant. In other words—to put it as directly as I can—to an outsider art history will often seem like bad writing, concocted by someone uninterested in the writer’s self, and unaware of the writer’s voice. Some contemporary art historians are at work on this problem, but the recent interest in first-person writing has only made matters worse, because it has injected an unmodulated confessional voice into a setting where it just doesn’t fit. Good writing, as the rarity of good writers attests, is harder than that. Does this matter? Well, it doesn’t if the only purpose of writing art history is to learn about the past. But if you ask yourself what you are actually producing, what you are spending your life making, then it starts to matter more than anything else. I’ve said this as strongly as I can in the last page of this book, and I still think that page is worth the price of admission. The rest is a thicket of problems that can have no clear solutions: if they were clear, they wouldn’t be art history. It would be wrong to conclude without underscoring the unimportance of all this. Thinking about the differences between the kinds of writing that go under names such as art history, visual theory, methodology, and historiography, I have been led toward a way of considering the texts that is, in important respects, alien to all of them. In general terms, the readings in this book approach art historical writing as if it were expressive in intent. What I have wanted to know is how the writing stands up as writing, as what is uninformatively called imaginative or creative writing—as if a principal purpose of art historical writing were to act on a reader as a novel, a short story, or a poem, rather than as a source of information. In doing so I have tried to read the texts in a fuller way, and cast some light on the nature of their relation to one another; but I have also been motivated by some ideas about the value of scholarly writing in general. The conviction on which this book is built is that in the end all the questions we customarily ask ourselves regarding the choice of theories and theorists, methods and methodologies, evidence, interpretation, and the constitution of the discipline are swept aside by what we actually produce. Our writing is our testament, it is what matters about what we do. And if that is the case, then our writing must be understood as an expressive endeavor, one that speaks for us and for our contemporary situation. To me art history is in a certain sense an arbitrary profession, since I tend to use it to explore my own thoughts, and to learn about myself. An object is always also a mirror of what I want to see, and of how I understand myself. What this commonplace helps us remember is that even though our texts afford some challenging puzzles, academic writing may be inexpressive and in the end uninteresting because it is chosen by people who do not wish their writing to compete on a higher level. There has always been truth in Nietzsche’s descriptions of scholars (“the herd animal in the realm of knowledge,” and so forth) and in those terms, art historical writing may be a fitting expressive vehicle: a kind of writing that is highly evolved to complement and maintain a certain kind of life. Our texts appear as history, as facts, as discoveries, as stories, even sometimes as truths, and they function in all of those capacities—but they are also our way of recording who we are. We need to begin to think about how our quizzical, convoluted, dry and distant writing tells the story of our lives. Those two excerpts from Our Beautiful, Dry, and Distant Texts: On Art History as Writing, written now about 15 years ago, can stand almost as they are to express what I think is missing from art history. Today I wouldn't say art history is necessarily "distant" and "dry," although it often is. But it remains every bit as true that art historians pick and assemble theorists and theories without paying attention to how they have been chosen or how they work together. And that, in turn, is only possible when the historian isn't paying attention to the writing itself, to its voice, its coherence, or its expressive content. Art history remains, in that sense, very much unconscious. In art history there is an intermittent interest in writing, and an intermittent awareness that in poststructuralism, writing cannot be adequately understood as a utilitarian vehicle for the articulation of historical thought. But writing on writing in art history has tended to be local (regarding qualities attributed to the writing of individual art historians), disciplinary (involving judgments about whether certain writers can usefully be considered primarily as art historians), or abstract (regarding the importance of writing, in general, in poststructuralism since Barthes). At the same time, art history as a discipline remains oblivious of the state of contemporary literary theory, so art historical discussions of writing tend to be conceptually and analytically impoverished, and to depend on old-fashioned criteria of literary style and taste. 1. By disciplinary habits, expectations, and protocols about art historical narrative, argument, evidence, and citation. These aren't uniform: they differ from one publication to the next, and they change from one decade to the next; but they exert a strong influence on the field. Every young art historian knows what kinds of narratives might be acceptable to The Art Bulletin or October. 4. By the disciplinary custom of limiting moments of expressive writing. Tone, address, style, manner, mood, voice, diction, authorial self-reference, the lyric, and metanarrative are intermittently encouraged in graduate students' writing, but only within the bounds of proper disciplinary interests. Outside of these constraints, and outside the art historical constraint of writing about fine art, there is the unexplored territory of writing in general, as it has been theorized in literary criticism since modernism began, and in poststructuralism since the 1960s. Reading a draft of this text online, Karen Schiff wondered what the goal of abandoning conventions might be, other than the pleasure of writing. My interest is in what might have to happen in order for art history and its neighboring disciplines to take writing as seriously as it has been taken since Barthes, Derrida, De Man, Altieri, Conley, Culler, Perloff, and many other critics and theorists. What I have in mind is a critique of art history's senses of writing, and how it presents writing to itself. In general, and with many exceptions, art historical writing remains dry, timid, affectively distant, conservative, and often inadequate to the very works it wants to address: and part of the reason for that failure of writing is a reticence about writing itself. The principal goal for writing outside certain conventions is to engage writing, and therefore the condition of the humanities in the twenty-first century, more fully. A secondary goal, which would not be mine, would be to capture more historical meaning for art history. I am writing you Prof. Elkins because as a mid-career academic art historian I feel like I'm hitting a formidable brick wall. May I run by you some work I'm doing and perhaps you could tell me if you think I'm merely being self indulgent in the writing? Sure, email me through the website jameselkins.com.